This balloon is made from the same high quality vinyl and materials as our other balloons, no seconds here. 12 panel design (our typical balloon has 20 panels) makes for less production cost for cutting and sewing. 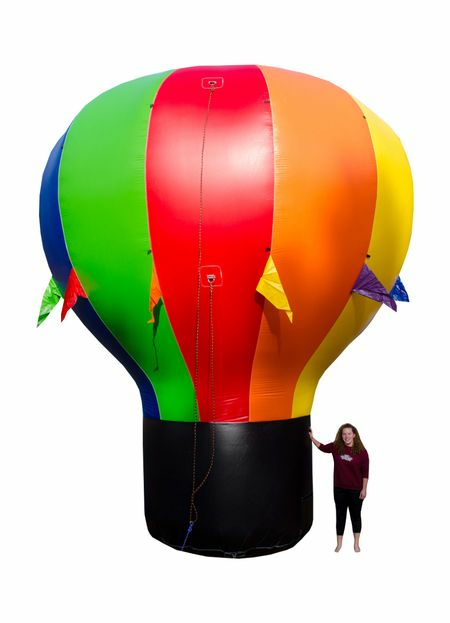 Great for a rental balloon, can be set up on the ground by one person easily. This advertising balloon can be roof installed by 3 to 4 people. Excellent visibility when ground installed in front of buildings. Remember, power lines are about 22' 25' from the ground so make sure of overhead clearance. This balloon is made of high quality, USA made balloon material (7.5 oz. coated nylon). All the seams are doube stitched twice. All the tie down points are 2" welded metal with 2" nylon webbing and reinforced with 18 oz. vinyl from the inside of the balloon. This balloon comes standard with no banner boxes (sewn white or yellow colored spaces for banner section). Optional yellow banner area (360 degree over entire balloon middle) is available for $100, you may want this if you expect to use the balloon with a light kit, though it certainly isn't necessary.